Visit Britain's only herd of free-ranging reindeer. With winter still here, for now, why not visit Britain's only free-ranging herd of reindeer in their natural environment. At this time of year all of our reindeer are out and about free-ranging in the Cairngorm mountains, winter coats are getting scruffier and the cows are looking increasingly pregnant with calving coming fast in May! Visits go everyday at 11am at this time of year, follow a reindeer herder as they lead you onto the reindeer's mountain free-range. Once there, your guide will tell you all about the reindeer and you can walk amongst them, stroking them and feeding them by hand. The walk usually takes around 20-30 minutes but could be as long as 45 minutes depending where the reindeer are each day. It will take you across some rough and snowy/muddy ground up the mountainside so make sure you've got some sturdy footwear and some nice cosy layers! Full waterproofs are a necessity. 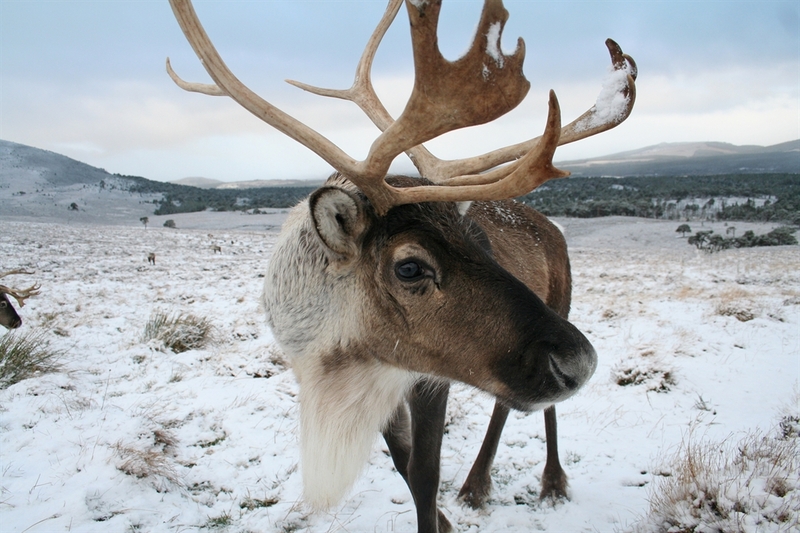 As the weather is often very snowy/windy and as the reindeer are free-ranging at this time of year please give us a wee call on the day of your visit (just after 9am is a good time) to make sure we've found the herd! Spaces are limited so please arrive in good time, we recommend to arrive as close to 10am as possible. We do not have a pre-booking system available so places are allocated on a first come first served basis. For those less able, from Easter to New Year, you can visit a small group of reindeer in the paddock & exhibition at the Centre, quizzes and crafts for children.